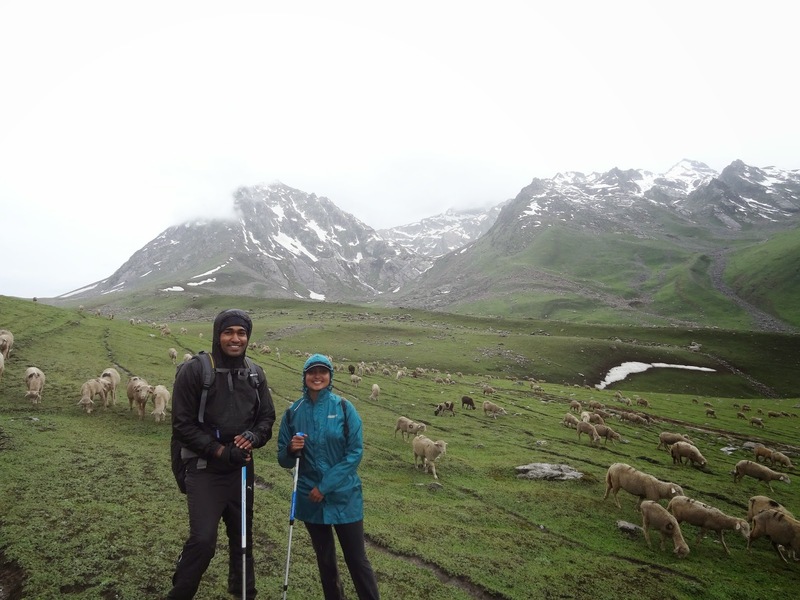 We were told that the day’s trek would be relatively simple and we could trek leisurely admiring the landscapes. But nature had other plans. It had to vent out its fury and make us realise that human beings are nothing in comparison to nature. Even the Sun wanted us to miss his presence and he happily rested behind the dark clouds. As the dark clouds hovered, we were all mentally prepared for a rain trek. The extra baggage that comes along with a rain trek is the rain clothing. It’s a bit pesky to trek around with a rain coat, rain poncho and water proof gloves. The trail crosses a stream and then heads up a lush green mountain. As we start trekking up this pencil thin mountain trail, it gives a feel of the western ghats. The terrain feels very similar. It rained incessantly and the Lush Green trail turned out to become a SLush Green trail. It’s good to have gaters for a rain trek as they prevent your track pants from getting dirty.The shoes got heavy with all the slush sticking to it and the trail was extremely slippery. At one point I saw two mules right in front of me slip and fall. Luckily the men accompanying the mules were able to push the mules back on track. The sight was scary as I thought the horses would just roll off the mountains. I trekked vigilantly further on , carefully taking one step at a time. Rains got heavier as we reached atop the mountain. I have very few pictures of this day as my camera was all packed inside. Once we reached the top we were now walking on a flat trail surrounded by meadows and the rains stopped for a brief moment. A flock of sheep were happily grazing on these meadows. I quickly pulled out my camera for a few shots. 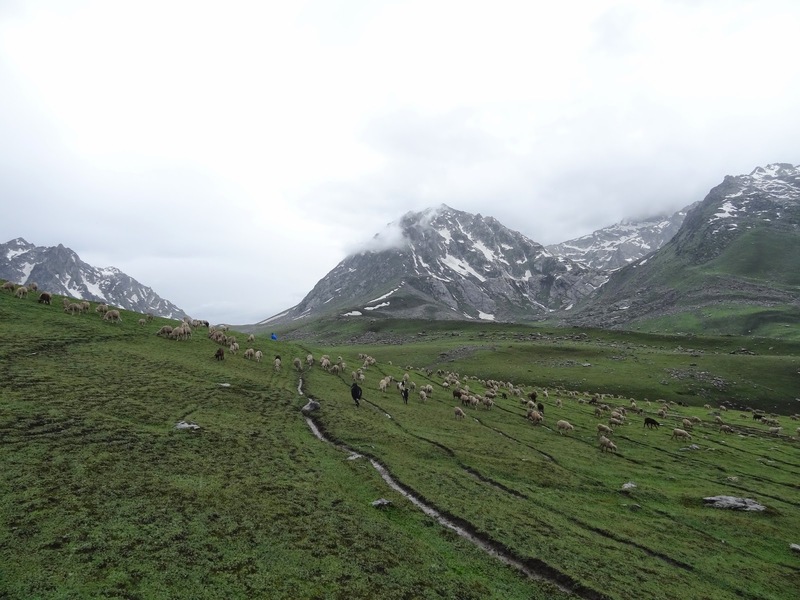 We trekked further on crossing some captivating landscapes, green beds and gorgeous streams. We camped near the Satsar army check post. It is the 3rd line of defence from the LOC. The army men welcomed us with a hot cup kahwah. Drenched completely, shivering in the cold, the hot cup of kahwah was extremely refreshing. When we reached our campsite, the rain had abated. I just sat in my tent shivering in the cold, totally blanked out. Just in time we were served with hot onion pakodas. We all pounced on the pakodas like starved pigs who haven’t been fed in ages. In no time the pakodas were over. Even our Japanese folk Miho, Kimi and Yuta were relishing these pakodas. Our clothes were wet and since we had just two pairs, we had to dry them. We used tent ropes and walking sticks to make a clothes line. Necessity is indeed the mother of all inventions. 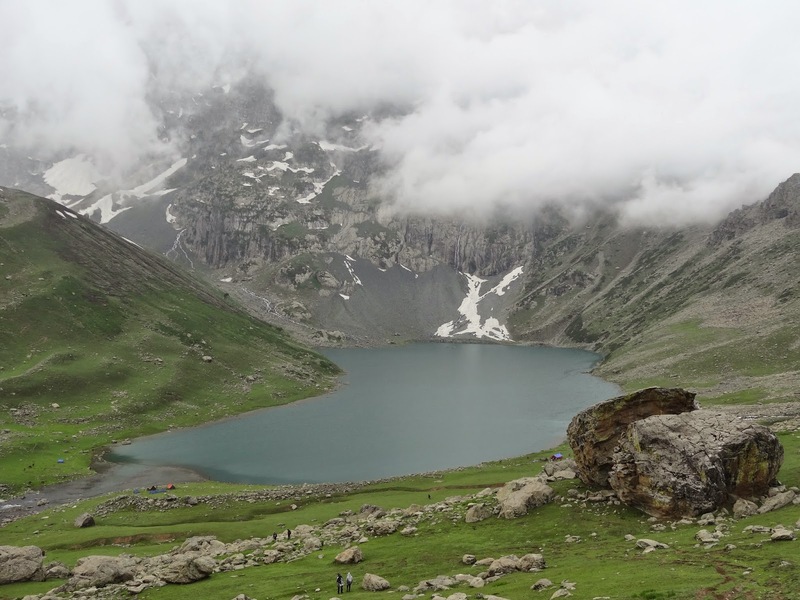 Satsar Lake is a collection of 7 lakes and with 10 minutes of walking you reach the first of Satsar lakes. It’s a pretty huge picturesque lake. In no time there was heavy downpour again and we were forced back into our tents.It was an awful night as our clothes and the sleeping bags were soaking wet. The temperature had dropped considerably and I had a very restless sleep due to unbearable cold. It rained all night, accompanied by fierce thunder and lightning.We feared we might get stuck at the campsite. 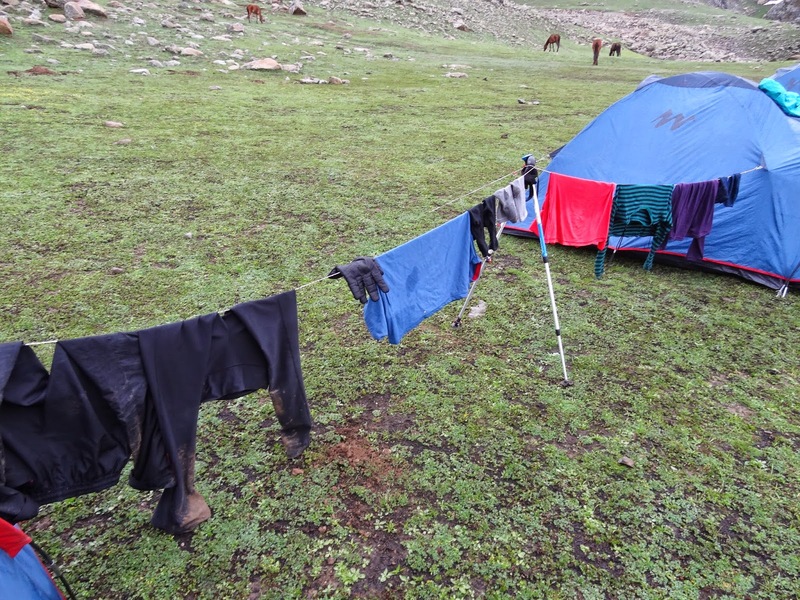 There were several stories of trekkers getting stuck at Satsar campsite for 2-7 days due to heavy rains and I just could not imagine a situation like that. I had scary nightmares and that was the only time in the entire trek that I wanted to go back home. Although it’s a nice story to narrate now, when in that situation all you can think of is getting out of it at the earliest. I woke up with utmost trepidation fearing bad weather. It was a foggy morning and the landscape around was completely covered by fog. 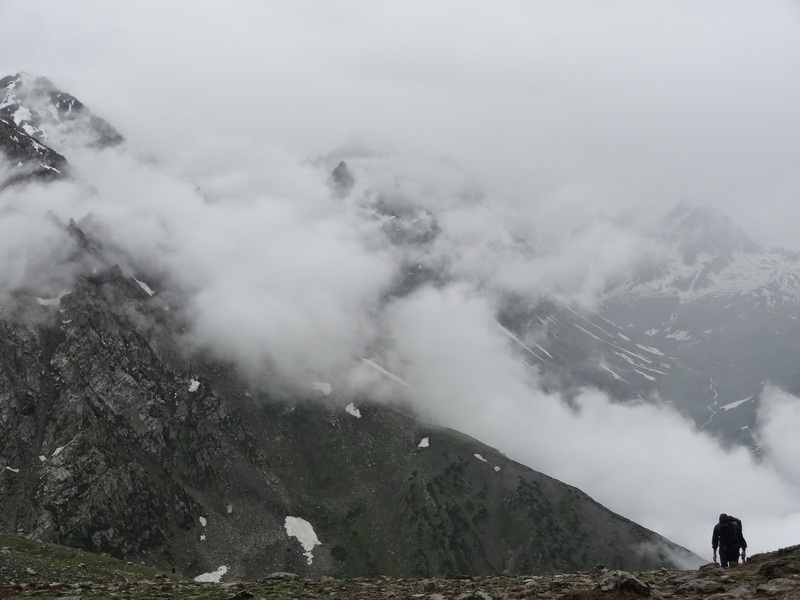 As we started our trek, in a few minutes the rain God showered his blessings on us. It was going to be yet another Rainy, slushy day. With a steep uphill snow patch, we reach the deadliest of all trails. It is a huge mountain completely covered by boulders. The boulder hopping was going to be one hell of a task with heightened difficulty level due to the rains. The boulders were huge and perilous. It was onerous to trek this patch all by yourself. But the trekkers were extremely cooperative and we all helped one another to complete this gruelling exercise. It took us about 3 hours to finish the entire boulder patch. 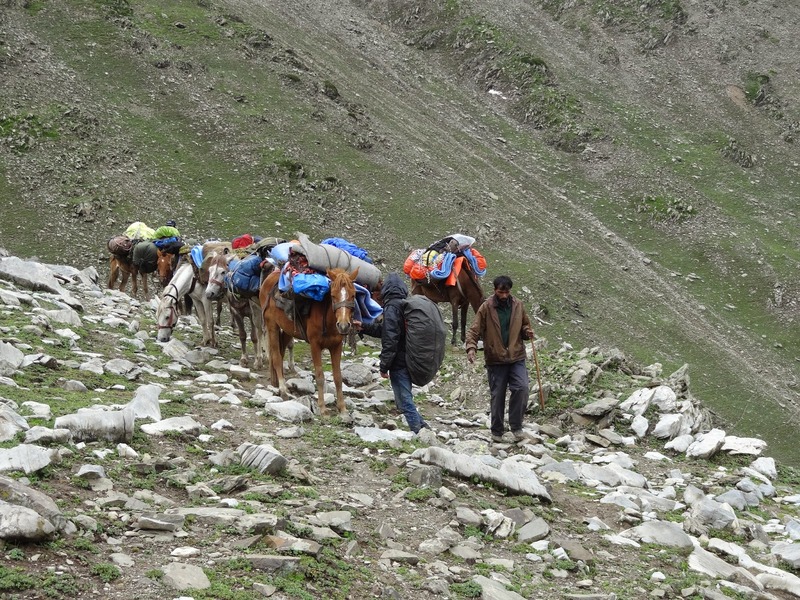 After a feat well accomplished, we now had to trek further uphill on a zig zag pony track. As we gained height, the temperature continued to dip further and the cold started to set in. On reaching atop, the temperature was close to 0 degrees and our hands turned numb and blue. Though the rains stopped, there were huge gusts of wind. With trembling bloated blue fingers I pulled out my camera for a few scenic landscape shots. The fog arising amidst the mountains, made me feel like I was trekking on clouds. It was an heavenly experience. 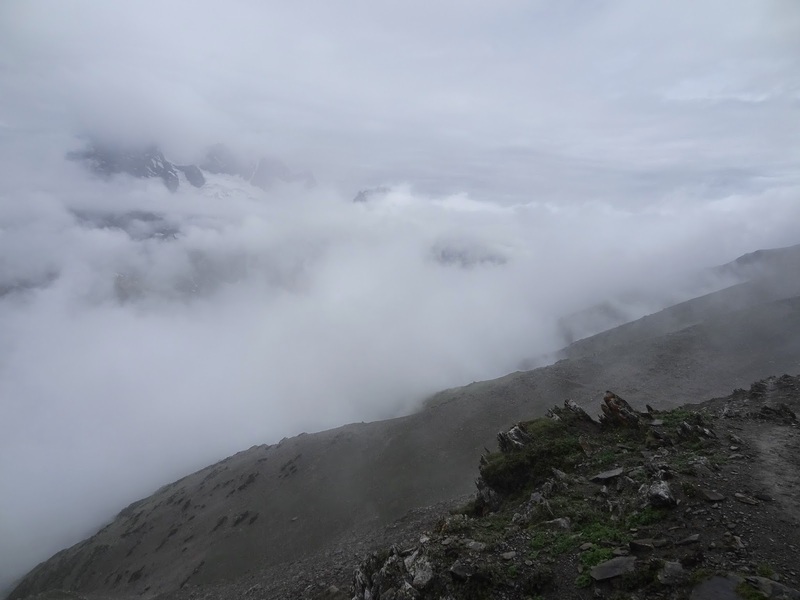 At a height of about 13,400 feet, we further had to descend to about 12,000 feet towards our destination. 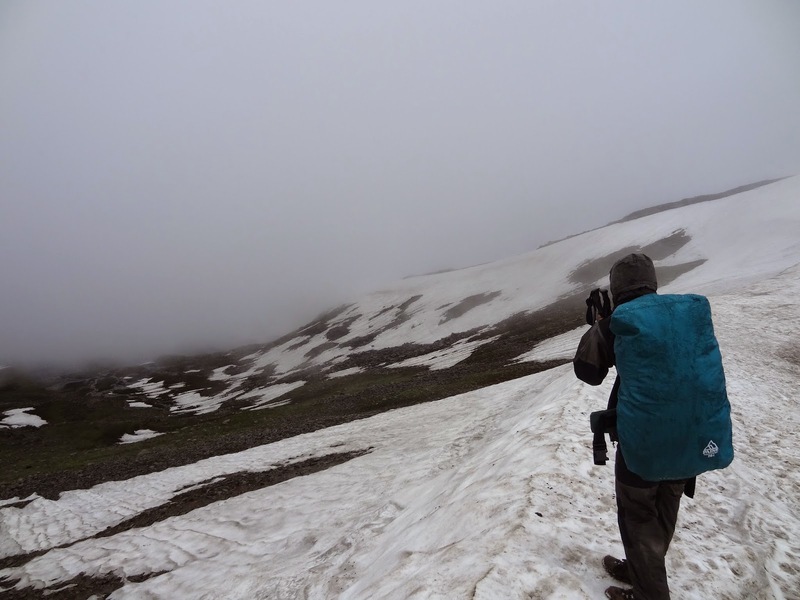 The descent was further gruelling with 5m visibility and slushy tracks. It literally felt like slush skiing. We trekked down to a spot waiting for co trekkers to join. The rains had stopped, but the view was completely covered by fog. 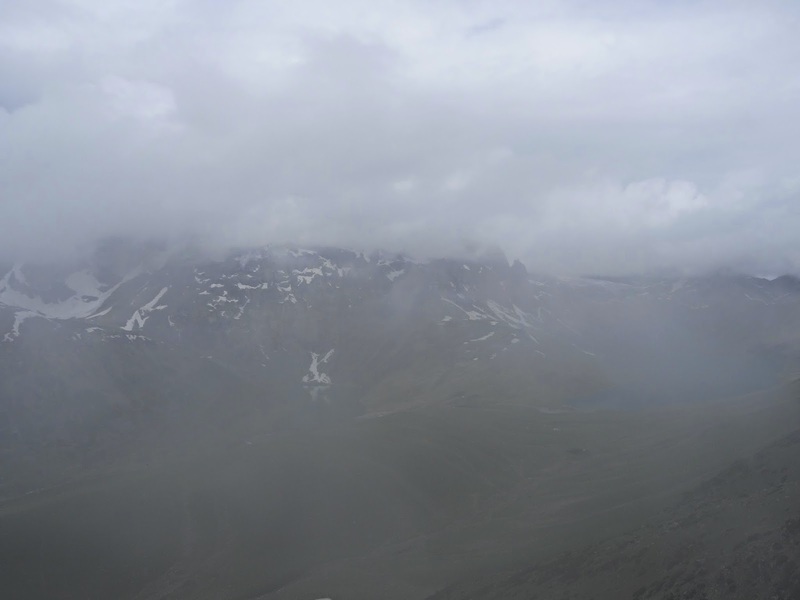 In about 10 minutes the white out cleared and we witnessed the most magnificent view of the Gangabal Twin Lakes. It felt like a newly wed bride, unveiling her Ghungat for the first time. The landscape was pristine and breathtakingly beautiful. Everyone was overwhelmed with the beauty and I could only hear camera clicks everywhere. 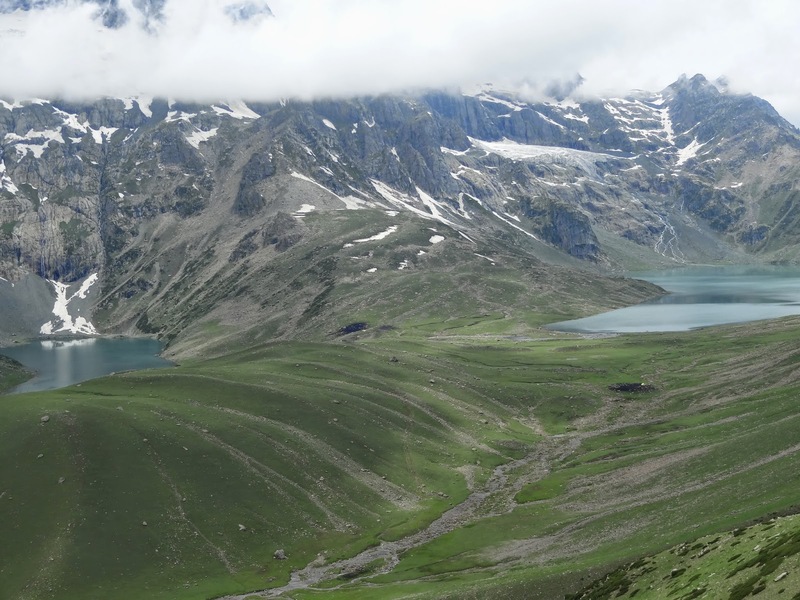 Lakes Gangabal and Nundkol looked majestic donning stony mountains and meadows on either side. As all co trekkers joined, we posed for a group picture. In all this excitement, we were informed of a tragic incident. One of our horses had slipped down the zig zag pony trail and was badly injured. There were also no chances of his survival. We were deeply saddened on hearing this remorseful news. The mule owner was melancholic as it was his third horse that he was losing this year. We had to continue our journey downhill, as our campsite was on the banks of Lake Nundkol. This was one of the most beautiful campsites.The Nundkol lake lies at the base of the Harmukh peak. The Harmukh glacier hangs on the sides of the rocky edges of the mountain. Both the Gangabal and Nundkhol are famous for trout fishing. 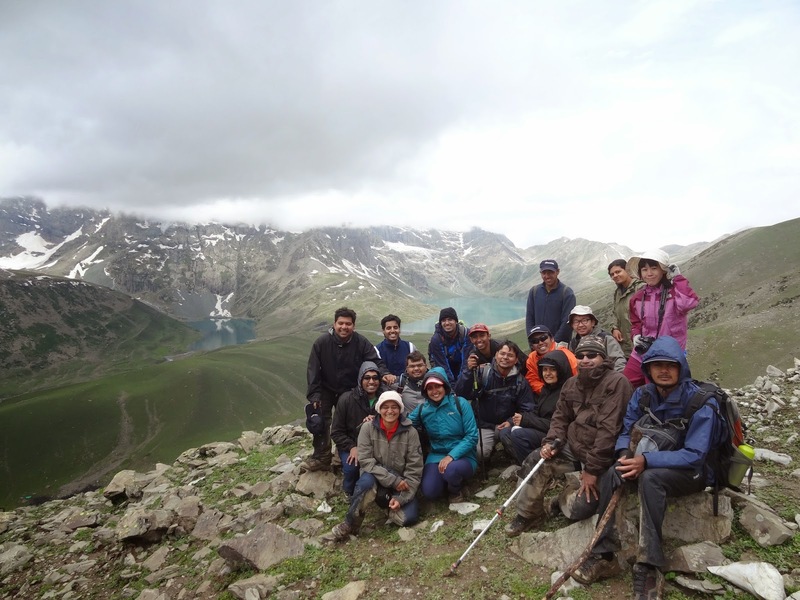 Several trekkers, trek up from Naranag side to camp at Ganagbal Twin lakes. The rain had completely stopped and finally, the Sun came out of its hiding. It was indeed delightful to see the Sun shining brightly. We could dry our clothes, shoes and sleeping bags. The evening was well spent chatting, fishing and playing frisbee. I spent time by the lake side, bemused in its tranquillity, penning down all my experiences. I felt a sense of accomplishment looking back at memory lane, revisiting the trails, landscapes and the hardships that we faced. Indeed a blissful feeling! I personally loved this blog more than the others 🙂 For some reason, I kept laughing reading the descriptions that you have given such as how we relished on the evening pakoda snack, how the first view of Gangbal & nandkol lake was to us, how the terrain reminded us of the western ghats. Beautiful narrative. That boulder patch in rain was really tough. And you correctly said, Nundkol was a gem!